wow looks so yummy dear. as the festival mood is setting in am craving more and more of sweets. this looks so good Priya...i really am craving some now. Looks yum. The name sounds interesting. Hope you will get a kiss from your beloved. Delicious Brazilian kisses! The photograph is beautiful and tempting!! Quick simple and a delicious sweet. Yummy Coconut kiss. It looks Delicious. Wow! The sweet is extremely tempting and lovely! Would like to grab some! These look like they would just melt in your mouth! Delicious! Nice coconut candy looks delicious. Looks soo tempting...and very easy recipe! oh these are beautiful and look great! Those look so cute and delicious!! Coconut Balls are absolutely droolworthy. Loved the way you have presented your creation. How nice to see beijinho de côco on your blog. It brings me back sweet memories. My mom used to make this at birthday parties, since my family is big I got to eat it pretty often. I like the fact that she got everyone helping roll the little balls. so easy and so beautiful...loved the name!!! wow.. condensed milk balls... sounds awesome! i am drolling on this candies..yumm..
Quick and easy sweet...looks delicious..
Looks beautiful. With just one ingredient almost. Nothing can beat that. easy and tasty-you've done it again!! these laddos r making me drool here..simple gorgeous ! They look melt in the mouth delicious! 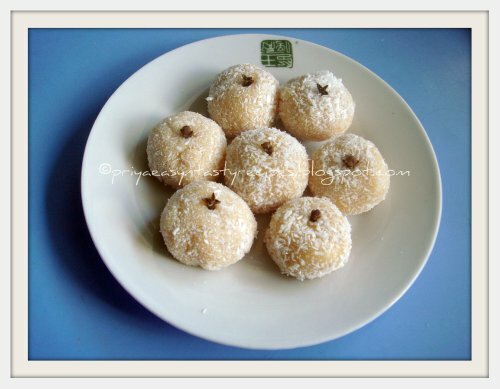 Yummy looking Beijinhos De Coco! Love your presentation and definitely makes me want to try some. this is a wonderful and easy sweet especially if one likes coconut! I can see myself having a few over coffee; thanks for a great recipe! It sounds indeed very easy and delicious. I am crazy with coconut. Easy and delicious. Thanks for sending it to the entry dear.